Prime Minister Manmohan Singh stirred up a hornet’s nest when he warned us not to succumb to unscientific prejudices against genetically modified (GM) crops. Speaking at the 101st Indian Science Congress in Jammu, he claimed that biotechnology has great potential to improve yields, and his government remains committed ‘to promoting the use of these new technologies for agricultural development’. The Prime Minister’s statement lauding the controversial GM technology hasn’t come as any surprise. Two environment ministers – Jairam Ramesh and Jayanthi Natarajan – have been eased out in the recent past in large part because of their opposition to GM crops. Jairam Ramesh was responsible for imposing a moratorium on Bt brinjal which if approved for cultivation would have opened up the floodgates for the introduction of many more GM food crops; his successor Jayanthi Natarajan is generally believed to have resisted industry pressure to allow field trials of GM crops. The stakes are, evidently, very high. For the multi-billion dollar industry, India’s refusal to accept GM crops can spell a death knell. In the face of the refusal by many State governments to allow field trials of GM crops, and the swelling opposition from the Parliamentary Standing Committee on Agriculture and subsequently the Supreme Court-appointed Technical Expert Committee (TEC), the industry has been stepping up pressure through back channels. But what is more important here is to understand how true the so-called ‘scientific’ claims of the industry are, and whether GM crops are actually safe for human health and environment. The Prime Minister said that GM technology has great potential to improve yields. This has been claimed by the industry too. But the fact is that it is now 20 years since the first GM crop was introduced in the United States, and there is still no evidence of a GM crop having increased crop productivity. The US Department of Agriculture’s own studies show that the yields of GM corn and soybean are lower than that of conventional varieties. Even in India, the Central Institute for Cotton Research (CICR) Nagpur, which monitors the cotton crop, has admitted: “No significant yield advantage has been observed between 2004-2011, when the area under Bt cotton increased from 5.4 to 96 per cent.” Thus, the argument that the world needs to produce more for the growing population by the year 2050, and therefore it needs GM crops, does not hold true. But let’s look at a more fundamental question here. Is there a shortage of food in the world? According to the USDA estimate for 2013, the world produced food good enough to feed 14 billion people. In other words, the world produces food for twice the existing population. The real problem lies in food wastage. Nearly 40 per cent of the food produced is wasted. In the US alone, food worth $165 billion is wasted, enough to meet the food requirements of the entire sub-Saharan Africa. In India, which has close to 250 million people going to bed on an empty stomach, appalling hunger is not because of any shortfall in food production. In June 2013, India had a record food surplus of 82.3 million tones. It has already exported 20 million tonnes out if it, and there are plans to export another 20 million tones so as to reduce the carrying cost of stored food. Instead of increasing food production, the Food Ministry is planning to reduce food procurement and also use the huge stocks with the Food Corporation of India for commodity trading. The promise of reduction in pesticides usage has also fallen flat. According to Washington State University researcher Charles Benbrook, between 1996 and 2011, farmers in US applied an additional 181 million litres of chemical pesticides. In 2012, on an average 20 percent more pesticides were applied by GM farmers. This is now expected to go up by 25 percent with the introduction of the next range of GM crops which will use a cocktail of herbicides including the deadly broad-spectrum chemicals. 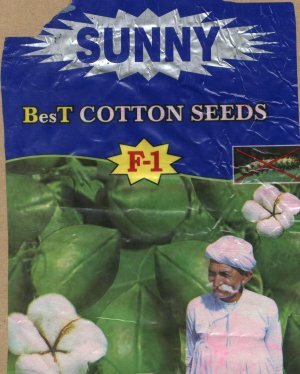 Has the Bt cotton bubble burst? In Argentina, the application of chemical pesticides has risen from 34 million litres in the mid-1990s when the GM soybean crops were first introduced to more than 317 million litres in 2012, roughly a ten times increase. On an average, Argentine farmers use twice the quantity of pesticides per acre than their American counterparts. In Brazil, which has recently taken over Argentina as far as the spread of GM crops is concerned, pesticide usage has gone up by 190 percent in the past decade. More worrisome is the emergence of hard-to-kill weeds, called ‘super weeds’. Estimates show that in the US, over 100 million acres are now infested with super weeds. Besides using a cocktail of chemical pesticides to control it, some US States are going in for hand weeding, since chemicals are no longer effective. In neighbouring Canada, more than 1 million acre is infested with super weeds. Studies show that 21 weeds have now developed resistance since GM crops were introduced. Insects, too, are now developing immunity against pesticides used with GM crops. In India, Monsanto has already accepted that the bollworm pest is becoming resistant. With no benefits accruing either in terms of increasing crop yields or reducing pesticide applications - and thereby protecting human health and the environment - it is difficult to see what promise the Prime Minister sees in GM crops. In fact, all evidence now points to an end of the era in industrial agriculture. With soils poisoned, underground water mined ruthlessly, and the entire food chain contaminated by chemical pesticides and fertilizers (leading to more greenhouse gas emissions), the focus is now shifting to ecological agriculture. In Andhra Pradesh, nearly 3.5 million acres today are being cultivated without the use of chemical pesticides; in fact, farmers do not use even fertiisers in 2.0 million acres. Production is steadily rising, pollution has come down, soil fertility is rising, the farmer’s income has gone up and there are no suicides in these belts. Isn’t that the model of farming that the Prime Minister should be advocating? If it can be done in 3.5 million acres I see no reason why it cannot be practiced over 35 million acres. That’s where the future lies. 3. Brazilian GM soybean cultivation decreased productivity, increased pesticide usage over past 10 years, Natural NewsBuzz. 4. As Argentina's Pesticide Use Increases, Many Worry About Growing Link To Health Problems, Huffington Post.